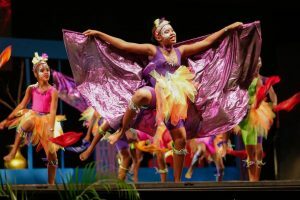 Members of the Tivoli Dance Troupe perform the dance “Soca Parade” at the National Finals of the Festival of the Performing Arts. Competition’s parish auditions, which will be held across the island. Beginning January 15, the auditions will continue until March and will cover all five subject areas of the National Festival of the Performing Arts: Dance, Drama, Music, Speech and Traditional Folk Forms. Students of the Middle Quarters All Age School in St. Elizabeth perform the Traditional Folk Form, the Gerreh at the National Finals of the Festival of the Performing Arts. “In addition to creating avenues to foster the creative and cultural expressions of all our entrants, the opportunities created through the National Festival of the Performing Arts are priceless and often life changing; in addition to our attractive prizes, such as cash incentives, trophies and gift packages,” Clunis continued. The National Festival of the Performing Arts is open to schools, community groups, youth clubs, social clubs, performing arts clubs, companies and churches, as well as outstanding individual performers. Entry forms as well as additional information regarding the National Festival of the Performing Arts can be accessed online at the JCDC website, www.jcdc.gov.jm and at the JCDC Head Office located at 3-5 Phoenix Avenue, Kingston 10 and all JCDC parish offices island-wide.